The Red Bulls celebrate Daniel Royer's late goal. Photo by Jason Schott. Columbus won the first leg at home a week ago, 1-0, and they didn't put much pressure on the net in this one, as Red Bulls goalkeeper and captain Luis Robles needed to make just three saves for his seventh career postseason clean sheet in his 20th career playoff match. Robles' seven career playoff shutouts move him into a tie with Tom Presthus for seventh all-time in MLS history. This was his eighth playoff win, which moves him into a three-way tie for ninth all-time in MLS history. The Red Bulls dominated from the start, as Kemar Lawrence nearly headed one in off a long pass from Kaku just seven minutes into the match. In the 17th, they had a free kick about 15 yards above the box, which was taken by Sean Davis. 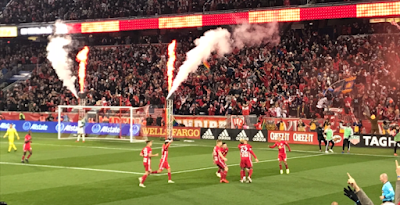 Daniel Royer, at the left side of the box, received the volley from Davis, fired it into the box to Aaron Long, and he fired a shot that deflected off Alex Muyl and into the net to make it 1-0 Red Bulls. Columbus had a couple chances late in the first half, as Gyasi Zardes received a pass in the box and headed it wide left in the 38th minute, while Federico Higuain took a corner kick in the 45th minute and fired a shot right on net, and Robles made the save. At halftime, the two-match seminal was knotted at a goal apiece, and Red Bulls Head Coach Chris Armas said of his team's mindset, "Halftime, getting the goal in the first half, it's good to relieve that pressure for the guys against a team that we knew would be organized and hard to break down. So at halftime there's a few things to talk about. We knew in transition there would be some moments we could slow down a little bit more, but there's some little things in there tactically that we were letting slip in our pressing and we had to address that a little bit. Some of it involves the back line moving up and just some little things. But there was a good energy in the locker room at halftime. A lot of belief that the second one was coming." The Red Bulls kept the pressure on and came close in the 72nd minute when Kaku fed Royer with a pass in the box, but he couldn't get a shot off. A minute later, Tyler Adams worked around three Columbus defenders at the top of the box, then got it to Kaku, who simply let the ball deflect off his shin guards back to Royer, who was heading down the center of the box, and he buried it to make it 2-0 Red Bulls. The thing about that goal was that Columbus still needed just one goal to win it, as that would have been a road goal, giving them the tiebreaker on a 2-2 aggregate. It didn't take long for the Red Bulls to take that away, as Royer got his second of the night in the 76th minute on a rocket from the top of the box. Red Bull Arena went into a frenzy, and Royer celebrated the goal with multiple cartwheels as his teammates trailed behind him. Armas said of Royer, "Well, I don't think anyone's so surprised with Danny bearing a couple of good chances that he had, a couple of good looks. So he's been pushing hard, training well, coming back from an injury, so I'm really happy for Danny to come in this game of this magnitude. So but again, coming in with 11 goals, he's that 1-2 punch with Brad (Wright-Phillips), so great for him." On the difference in his team between legs one and two, Armas said, "Well, on the road it's hard in our league. And Columbus, on the year 11 wins at home, they're tough at home. So that in itself make it's tougher. That's a big difference, a starting point. But tactically we pushed Tyler higher up the field. When Wil Trapp and Artur, those guys they're not just good on the ball, they're the outlet all the time for how they break pressure, break our pressure, and we said we can't let it happen again. But how can we address up the field being aggressive and not get sliced through. So some of it was to really address how we would control spaces, and this game we did a much better job of that. But pushing Tyler higher along with Kaku and pressing the way we did, I thought was the big difference." Armas said of how his "wide" players Royer and Muyl and the defenders did in this one, "Yeah, I mean up the field, if you didn't talk about the -- if you first talked about Danny and Alex in the pressing it's one thing, but then with the ball, now they're producing, they were a force now in the attack. And then Kemar and (Alex) Murillo on the night, it was lacking in the first game and maybe we're being a little conservative, staying home a little bit, it wasn't really the game plan, but that's the way it played out. And so you go there and doesn't feel great because, yeah, you lose the game, but we didn't give up that second goal and more. We gave up six shots on the night. There's a lot of said with the Red Bulls are six shots at Columbus Crew. No one talked about that, right, but we felt good like, okay, in our building we'll take care of it. But tonight the emphasis was to get -- attack the flanks and we did. And the crosses early in the first half with Kemar, you see Murillo getting forward, they were both dangerous. And so the wide play was great tonight." Columbus Head Coach Gregg Berhalter said of the match, "They played an excellent game. We weren't at our best tonight and when you're not at your best it's very difficult to win. I thought that we hung in there. The second half picked up a little bit, but overall not enough on the night." Berhalter is the heavy favorite to be the new United States Men's National Team coach, and he gave a simple "no" to what his next move is, and deflected other variations of that question. Armas said of Berhalter possibly taking over the USMNT, " If he's the next national team manager, we're behind him. We're behind him and with another tier of players it would be fun to see what he could do. But he will do great. He would do great." The Red Bulls are in the Eastern Conference Finals for the first time since 2015, and they will take on Atlanta United, who dispatched NYCFC in their semifinal. Atlanta, the second seed in the East, will host the top-seeded Red Bulls in the first leg on Sunday, November 25, while the Red Bulls will host the second leg on Thursday, November 29 at 7:00 pm.